Protesters chanting "Go home Nazis" have disrupted a white supremacist's speech at the University of Florida. Richard Spencer's address in Gainesville prompted Florida's governor to declare a state of emergency. His speech came two months after a far-right rally in Charlottesville, Virginia, left a woman dead. Three of Mr Spencer's supporters have been charged with attempted murder after firing into a crowd of protesters during the event. Texas natives William Henry Fears, 30, Colton Gene Fears and Tyler Eugene Tenbrink, both 28, threatened the group and shouted Nazi salutes, according to the Gainesville Police Department. Mr Tenbrink got out of the vehicle and allegedly fired a single shot, missing the crowd, as the other two men encouraged him, police said. The suspects fled the scene and were later arrested. Two others were arrested in connection to the event, police added. Inside the the campus auditorium several dozen supporters of Mr Spencer were overwhelmingly outnumbered by protesters who shouted down the speaker. Media captionWhy did a black man hug a neo-Nazi skinhead in Florida? 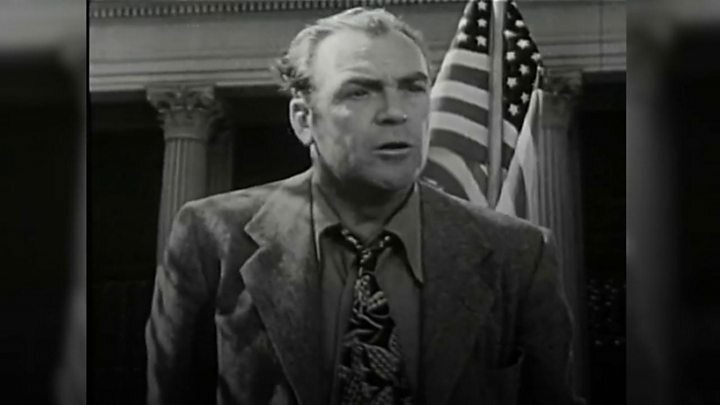 "I'm not going home, I will stand here all day if I have to," Mr Spencer said, calling the crowd a mob of "shrieking and grunting morons". Audience members continued to heckle him, chanting "Nazis are not welcome here" and "Let's go, Gators!" - a reference to the college mascot. The university said it did not want to let "vile" Mr Spencer speak, but was obliged under law to do so. The university was prepared for the worst. Roadblocks and barricades were set up to control the crowds. And helicopters and drones circled, while snipers stood atop buildings surrounding the Phillips Center for Performing Arts. Most students avoided this side of campus altogether, but a sizeable number did still turn out, either to attend the speech or decry it. Spencer's national policy institute tried to screen those seeking tickets, but once the so-called leader of the alt right started speaking, it was clear they had failed. Richard Spencer began his remarks declaring everyone had the right to free speech, ideology aside. But immediately, it was clear that the majority of the crowd was determined to drown him out with their own message. They chanted "go home" and "Nazis are not welcome here". Dozens held raised fists in a sign of resistance, others chose the middle finger to express themselves. Mr Spencer taunted the crowd in return, calling them shrieking and grunting morons, a mob whose action he said was the best recruiting tool for his group. Police began dressing in riot gear as the emotions ran high but Mr Spencer left the stage once his allotted time ran out. And both sides have remained for the most part peaceful. The Alachua County Sheriff's Office said two people had been arrested. One man, who they said was armed security hired by the media, was arrested for carrying a firearm on campus. Before Thursday's speech at the college performing arts centre, Mr Spencer addressed media to thank university president Kent Fuchs for allowing him to speak, according to the Miami Herald. 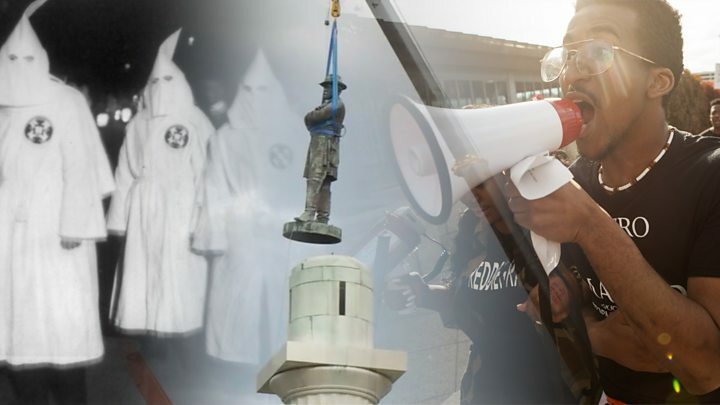 The newspaper also reported that two Democratic state legislators filed bills on Thursday to remove all remaining Confederate monuments from the state's public spaces. Mr Fuchs tweeted: "I don't stand behind racist Richard Spencer". According to the Anti-Defamation League, a Jewish anti-bigotry group, flash mobs are being encouraged by the Daily Stormer, a neo-Nazi website, at minority and Jewish institutions during the speech. The college said it would have to spend more than $500,000 (£380,000) on security while hundreds of state and local police were deployed to campus. Mr Spencer's organisation, the National Policy Institute, is paying $10,000 to rent the facility. Image caption Hundreds of protesters gathered outside, some of whom shouted: "We don't want your Nazi hate"
Protesters unfurled a sign on campus proclaiming "Love, not hate" and drew chalk designs on a pavement promoting inclusiveness and diversity. 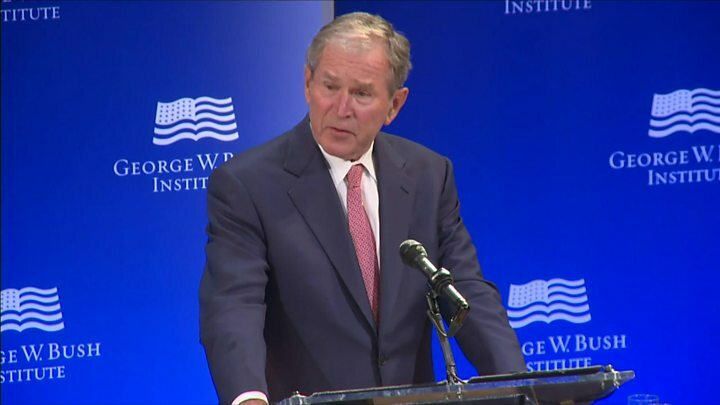 Meanwhile, former President George W Bush decried intolerance while addressing an event in New York. "Bigotry or white supremacy in any form is blasphemy against the American creed," he said. Mr Spencer has described this week's emergency declaration by the state governor as "flattering" but "most likely overkill". Mr Spencer, a figurehead of the racist alt-right movement, rose to prominence when he led chants of "Heil Trump" to a Nazi-saluting group in Washington after the president's election victory. He also helped to organise August's rally in Charlottesville, where he was the ringmaster of a large group of far-right activists chanting "Jews will not replace us" and "blood and soil" (a Nazi slogan). 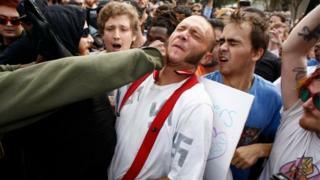 White supremacy: Are US right-wing groups on the rise? Media captionRacism in the US: Is there a single step that can bring equality? 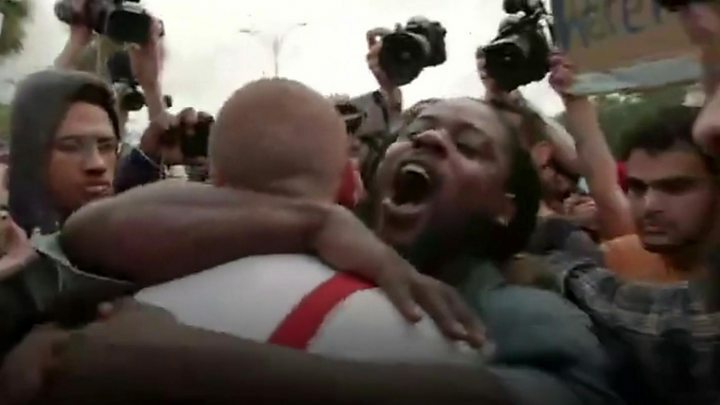 Video Why did a black man hug a neo-Nazi skinhead?